Branson’s “Golden Sounds” will fill you with musical memories of those fabulous 50’s and swingin’ early 60’s! Enjoy the unforgettable classics made famous by The Platters, including Twilight Time, Smoke Gets in Your Eyes, Only You, and My Prayer. From start to finish, this is the show that will launch you back to the days when you dressed in your Sunday best for every date, drove a hot rod car to the drive-in movie, and slow-danced the night away! And, in keeping with the amazing harmonies of music from the time, you’ll hear Doo Wop songs that’ll get your feet movin’, and those sensational Motown songs that’ll have you snappin’ your fingers and singin’ along! 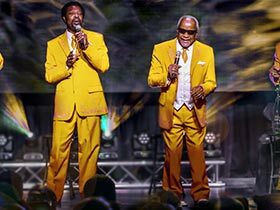 “Golden Sounds of The Platters” isn’t just for those who remember the good ole’ days; it’s perfect entertainment to share with the kids, grandkids, and everyone who loves great music!